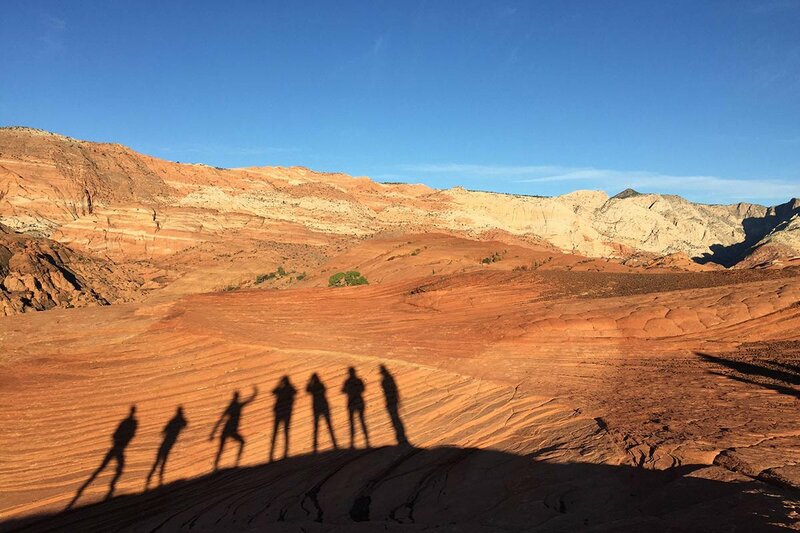 Shadow dancers at Snow Canyon State Park. Photo by Linda Cabasin. If your New Year’s plans include making time to recharge, Utah’s red-rock landscapes and blue skies provide an inspirational backdrop. 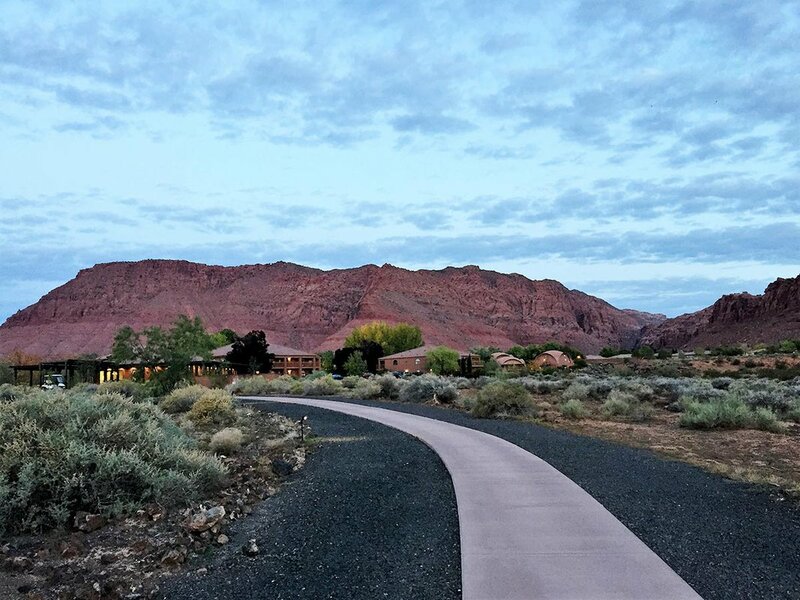 Linda Cabasin reports on hiking and meditating at Red Mountain Resort near St. George. 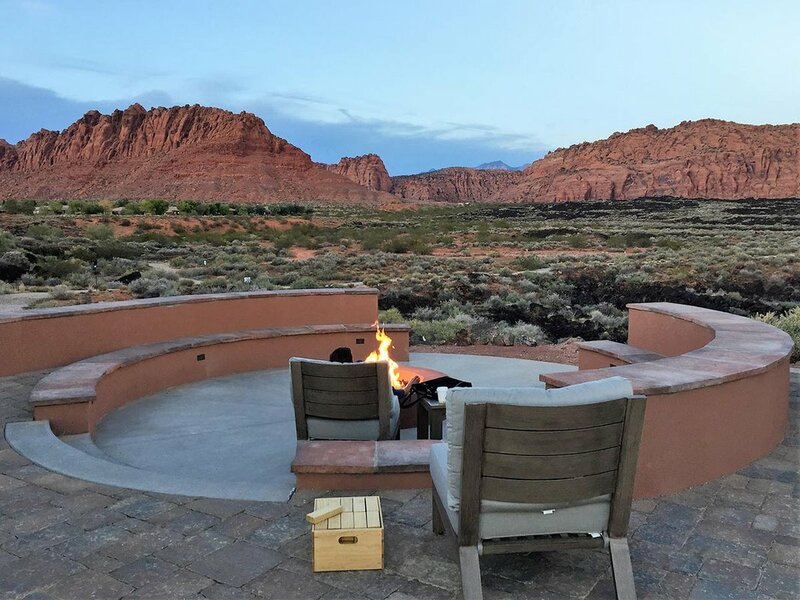 IVINS, Utah – I visited as it celebrated twenty years of offering wellness and adventure activities in a spectacular high-desert setting. Friends had found plenty of good times there, as well as renewed energy for daily life, and I was eager to experience this myself. Deep in southwestern Utah, surrounded by towering red-rock landscapes and the mountainous, stark Mojave Desert, Red Mountain has a majestic setting that quite simply takes you out of yourself. The resort’s proximity to and other parks makes it ideal for adventure seekers. It’s a perfect place to reflect and recharge or simply relax and appreciate nature. Red Mountain also has a long-standing reputation for being an excellent value compared with other all-inclusive wellness resorts. It’s a reputation that’s well-deserved. 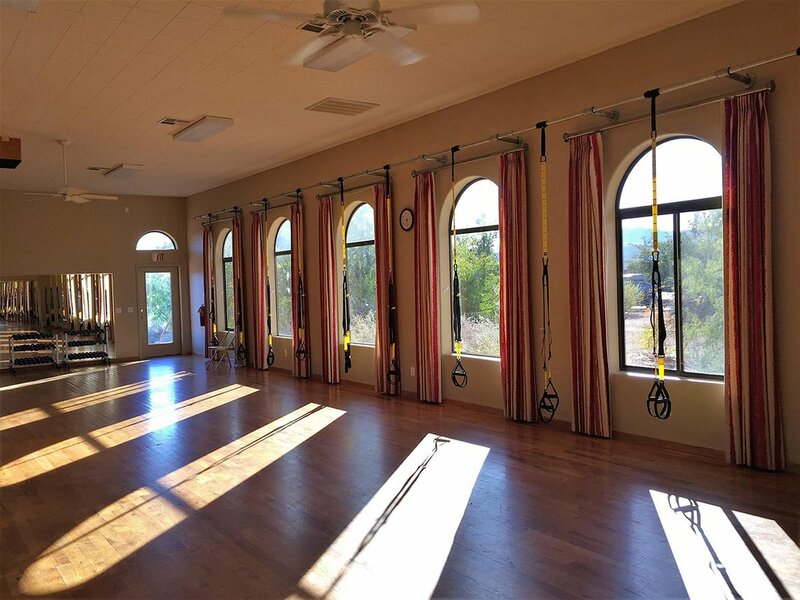 Everything you need is here or nearby: exercise and wellness classes, as well as private coaching; satisfying, healthy food; fabulous hiking and adventures for all abilities; and a good spa. It’s all low-key and low-pressure. Red Mountain has a high percentage of repeat guests, and I could see why: The staff is expert, caring, and focused on guests’ well-being. Check out all our . Late afternoon view from the Red Mountain firepit. Photo by Linda Cabasin. 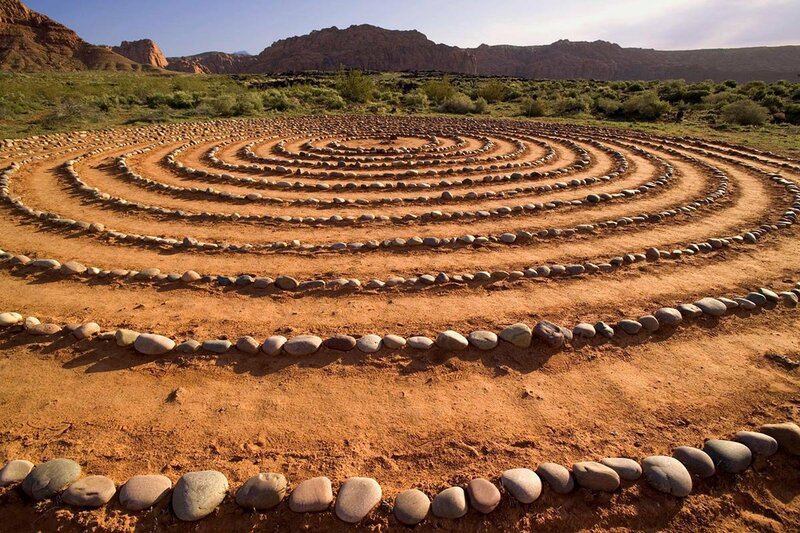 Spiral labyrinth pathway. Photo courtesy of Red Mountain Resort. Early morning stroll. Photo by Linda Cabasin. 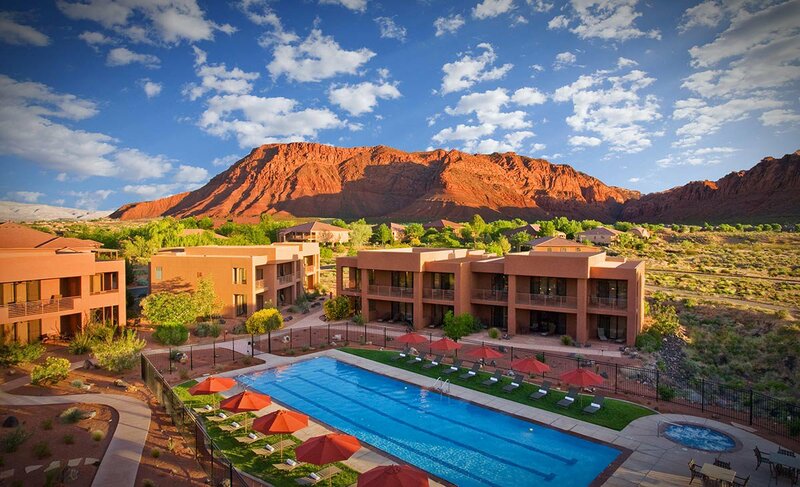 Red Mountain Resort is in Ivins, near St. George and close to Arizona. St. George (metro area 155,000) is growing rapidly with snowbirds, retirees, and families seeking an outdoor lifestyle. I saw housing sprawl and malls as well as beautiful countryside. Red Mountain is 150 miles northeast of Las Vegas; Salt Lake City is 300 miles north. The common thread was an appreciation for nature and a desire for a healthy lifestyle. About 35 percent of the guests are, as I was, on their own, making Red Mountain excellent for solo travelers. Women dominate (65 percent), but there are plenty of men. Children must be at least 12, so this is a limited option for families. I met lots of folks from California, the Pacific Northwest, and the New York area. Some were on girlfriend getaways. Some were taking time off from demanding jobs and/or caring for relatives. Some wanted to reboot their lifestyle or take on a physical challenge. The hike's the thing. Photo courtesy of Red Mountain Resort. 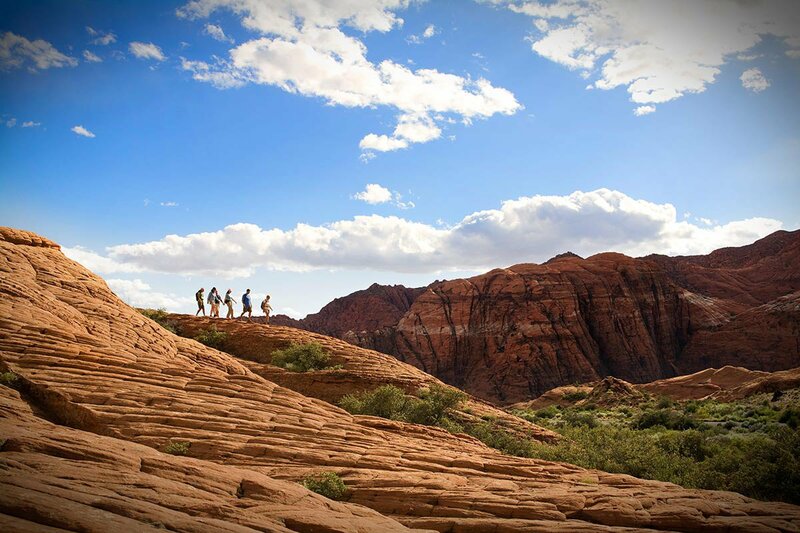 A hike with Red Mountain’s terrific guides is an unforgettable way to imprint Utah’s beautiful landscape in your memory and soul. You’ll learn about desert plants and geology and explore red-rock cliffs and sandstone mountains. There are virtues in not over-programming, in relaxing by the firepit with fellow guests. To best plan your time, though, read the activity descriptions and daily schedule in advance. Many classes are free with retreat packages (you’ll likely be on one). Other activities have a fee but may be highlights to book ahead, such as a Zion National Park excursion. The exercise room. Photo by Linda Cabasin. Nights are quiet, but there’s plenty to do during the day. Here are things I liked or wanted to try. To me, this was Red Mountain’s secret sauce, included in packages. Top-notch guided, small-group hikes in different soul-stirring spots take place daily at 8 a.m. (7 a.m. in summer due to the heat). These two- to three-hour hikes are for different abilities — the adventure concierge or the guides can help you choose a level. Two guides on each hike gave us insight into everything from the Ancestral Puebloans and the petroglyphs in in the Mojave, to the intricately textured red and white sandstone formations and the yucca, pinon pine, and juniper in , close to the resort. Red Mountain also offers specialty hikes for an extra charge, from a lava-tube adventure to a popular excursion in Zion National Park, one hour away. The daily schedule lists more than 25 activities: hikes, yoga, barre, stretch, core, cardio, and more classes. Cooking demonstrations and wellness workshops are on tap. Not all take place every day (you can pay for some private sessions), so, as I said, study your options. Some classes require advance registration, others are drop-in and free with a package. I had a wonderful instructor for two different stretch classes. My 90-minute Successful Meditation class cost an extra $55, but the teacher’s practical, positive approach and the meditation material made it a highlight. In terms of getting good value, I liked the Essential Retreat, but when you book a stay, check the for everything from specialized Health and Wellness Retreats to Self-Discovery Retreats. The tan-colored, dome-like spa building seemed endearingly quirky to me. Accessing the ’s different levels by a circular staircase was a bit unusual, and the dressing area was small. Still, a soothing atmosphere, good service, and a serene waiting area with stunning mountain views created a satisfying complement to exercise. My Red Mountain Revitalizer included a body scrub, a shampoo, and wet massage under a Vichy shower, and an application of prickly pear body butter. Other guests praised the Red Rock Hiker’s Massage, perfect after a trek. Spa treatments aren’t inexpensive and aren’t in all packages, but the indulgence can feel worthwhile. I was impressed by what Red Mountain offered guests of all interests and adrenaline needs. Those who want to bike can use the free vehicles on-site to visit places like the art galleries in . On the other hand, people can try the challenge of all-day canyoneering or sunset rappelling. They offer low-key bird-watching trips and a visit to an animal sanctuary, or you can set up a custom adventure. I didn’t use the swimming pools or whirlpools (which the people I met loved), but having indoor and outdoor options was appealing. Red Mountain has 82 rooms and 24 villa-style suites in a number of buildings. range from the smaller, cozy Dragonfly Solo to a Mountainview King and are decorated in earth tones, from ivory and tan to brown and orange. Bathtubs are ample for soaking. The (where I stayed) include larger rooms with gas fireplaces, a large shower and soaking tub, and a deck or balcony. Villa suites have a full kitchenette, table and chairs, and a large sofa. The villas also have an earthy palette and dark wood. Rooms aren’t hyper-luxurious, but to me they matched the relaxed setting and vibe. It’s all very comfortable, with Wi-Fi, robes, safes, and June Jacobs toiletries. Groups can book interconnected villa rooms, and pets are welcome in some rooms. Canyon Breeze Restaurant al fresco dining. Photo by Linda Cabasin. Meals were included in my package, and the was as healthy and flavorful as I’d heard from friends. 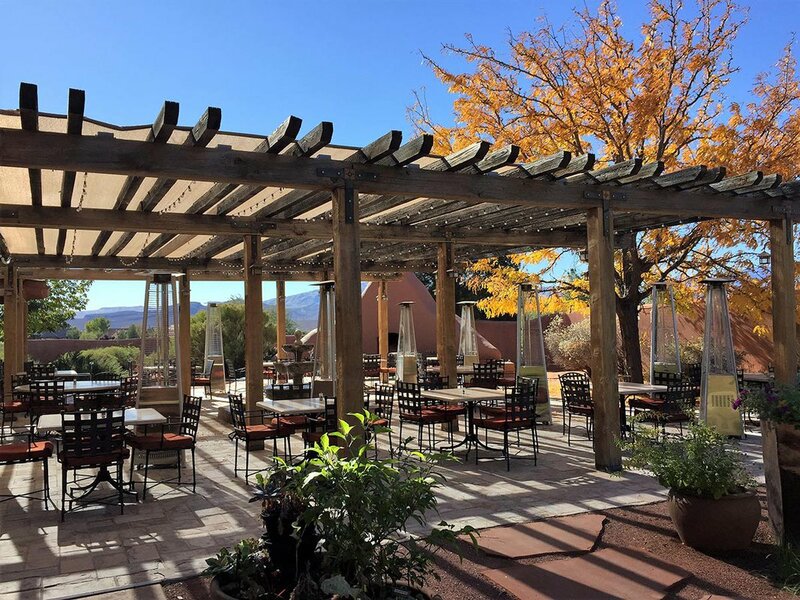 I ate in the casual Canyon Breeze Restaurant and had lunch on in its patio in late October. Breakfast and lunch are ample buffets, with breakfast options like eggs, oatmeal, and yogurt. Lunch had themed (Indian, say, or Southwestern) mains as well as salads. Samples indicated portion size and calories. Some items surprised me, and I learned a lot. I signed up for the community dinner table, where solo travelers can eat with a small group; I loved this chance to share resort experiences. Dinner included soup and a salad bar, an entrée and a good-size dessert from a daily-changing menu. Wine and beer cost extra. Vegetarians and vegans had a good menu of main courses. The menu listed calories, and some mains seemed a bit small, so I filled up on salad or soup. Smart seasonings and fresh ingredients made dishes like my vegetable Napoleon and mango habanero shrimp appealing; Red Mountain published a for its twentieth anniversary, with great dishes. 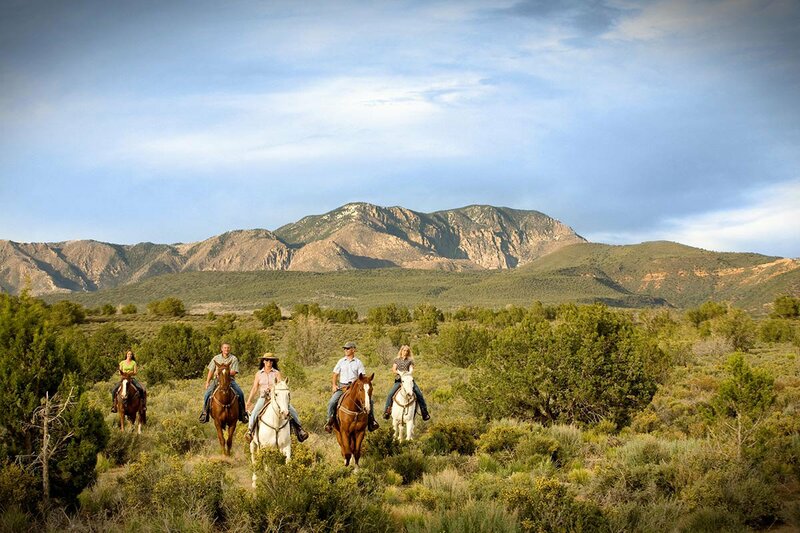 Red Mountain Resort in southwestern Utah may seem remote, but it’s just 150 miles northeast of . Many people fly into and either a shuttle or rent a car for the two-hour drive to Utah. I flew into and took a flight into (SGU), where the resort’s complimentary shuttle picked me up for the 30-minute drive to Red Mountain. Other gateways, such as Denver, Los Angeles, and Salt Lake City, have service to SGU. The resort website has a handy with transportation options. I didn’t feel the need for a car during a short stay, given the abundant activities available through the resort. People who want to head off on their own for a day trip would find a car useful. St. George has more than 300 days of sunshine annually, so you’ll likely see those brilliant blue skies whenever you visit. Summer temperatures can reach 100 degrees or higher, and even May has an average high of 85 degrees. Fall was perfect for me, with temperature between 50 and 70 degrees. Winters aren’t too cold; hiking and biking goes on year-round, even when it’s 30 or 40 degrees. All-inclusive packages offer solid value. There’s no resort fee, and your nightly rate includes a tip for items such as housekeeping and hiking guides. If you purchase additional services such as spa treatments or special workshops, a fifteen percent tip is added to your bill. You can arrange to leave more for outstanding service. Spa treatments can be booked from 10 a.m. to, in general, 7 p.m.. The people I met favored a massage or treatment after an active day, and these slots can get filled. Book ahead if you want a late-afternoon treatment before dinner. I packed layers for a late October visit, from long-sleeved T-shirts and a fleece to a windbreaker. Take workout wear, hiking boots, and swim attire. Skip the dressier clothing. Retreat packages include a water bottle to keep you hydrated.